Magik: Magik, free easy way to enjoy your photos. Magik, free easy way to enjoy your photos. 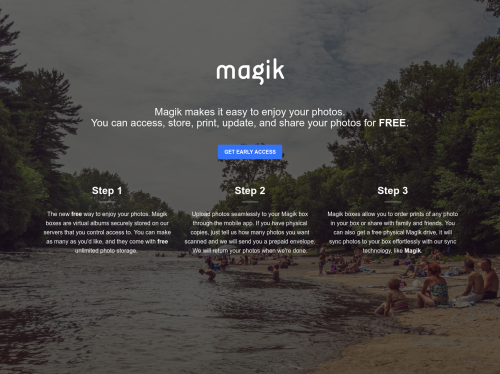 Magik is the new free way to enjoy your photos. Magik boxes are virtual albums securely stored on our servers that you control access to. You can make as many as you'd like, and they come with free unlimited photo storage. We also scan physical photos and store them in your Magik box. Order prints of any photo in your box or share with family and friends. You can also get a free physical Magik drive, that stays sync'd with your virtual box with just a few steps.